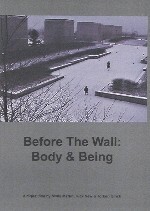 Torben Ulrich: film & video: "Before The Wall: Body & Being"
seen as a sequel to Gil de Kermadec's "The Ball and The Wall"
of the entire film (sounds played out by Lars Ulrich). Directed by Molly Martin, Rick New and T.U. Liner notes part one and part two (PDFs). Watch the film online or order the DVD. At Metallica's Orion Music + More festival, June 23-24, 2012, Atlantic City, N.J., USA. Clips presented and discussed at "Front Row with Lars Ulrich and Friends" (includes some video of T.U. and L.U. 's segment) at the University of California at Berkeley, March 2, 2016. At an evening celebrating T.U. 's 90th birthday, along with "Motion Picture" and "Leaping, Looping: Before The Call". October 11, 2018, at The Cinemateque, Copenhagen, Denmark.